Double Olympic gold medallist Shirley Robertson was at the show this morning for the naming ceremony of the brand-new Farr 645. Moored on the outer berths of the show pontoons, the chic-looking Farr attracted crowds who’d gathered to witness Robertson crack open a bottle of the best Champagne. Not surprisingly Robertson was honoured to name the yacht ‘Gold’ in recognition of her and the other GBR team members’ success at the recently concluded Olympic Games in Athens. This new yacht from the drawing board of Farr Yacht Design is the first of a range of new yachts from the Farr office. She’s designed as a custom-built performance cruiser but with her powerful carbonfibre rig and speeds of 18kts on her delivery from Sweden, something suggests she’s going to be one to watch on the racecourse. Her clutter-free deck layout and interior design show a remarkable resemblance to Peter Harrison’s 115ft ketch Sojana that was launched a year ago ( see previous Sojana news story here ). 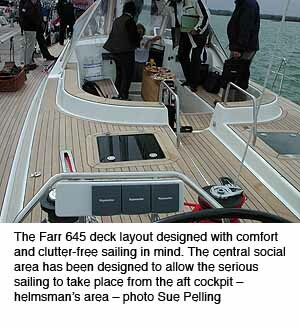 Interestingly it was the same designers – Mark Tucker from Design Unlimited – who styled the interior using dark-stained mahogany, and who designed the deck layout which includes a special social, control/line-free area, just forward of the helmsman’s cockpit. All the major control lines are led aft, under deck to helmsman’s area to keep the decks free from lines. The boat on show has already been sold to Germany for £1.4 million (2.2 million Euros) and according to Stewart Oliver from the Farr office there’s been no shortage of interest over the last few days. The build time for this custom-designed yacht is about a year with a delivery time of a year and a half. Contact Boat Sales International at: www.boatsales.co.uk.